Ready to experience Total Activation with healthier, younger, and visibly firmer skin? Get our complete system and save over 50%! WHAT IS IN YOUR TOTAL ACTIVATION FIVE STEP SKINCARE SYSTEM? Awaken your skin and promote natural cell turnover with a bioactive exfoliating cleanser. Natural sugars remove dead skin cells while vegan plant-based bioactives promote skin rejuvenation. Don’t just cleanse and open your pores; exfoliate and activate for a firm, youthful complexion. A powerful, collagen-boosting blend of HA (Hyaluronic Acid) derived from exotic plant extracts, nourishing botanicals, and free radical-fighting antioxidants awaken and firm skin, reducing the appearance of wrinkles within a few applications. Firming effect is multiplied when applied after Total Cleanser. Dramatically reduce eye wrinkles and lines with clinical-strength peptides developed to penetrate the delicate skin around your eyes. Miracle Eye Gel’s activating peptide formula contains naturally occurring amino acids that halt skin breakdown while firming for a more youthful appearance. 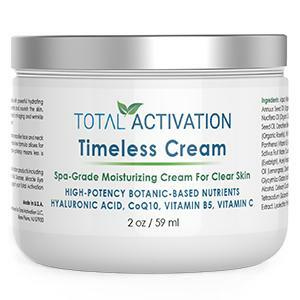 Timeless Cream is a maximum clinical-strength collagen boosting HA (Hyaluronic Acid) and CoQ10 formulation that rapidly heals and firms skin. The highest-potency Total Activation treatment available, use on heavy lines and wrinkles for visibly smoother skin after just a few applications. 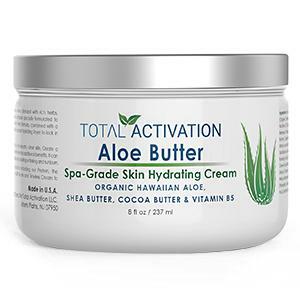 Specifically formulated for any area of your body, Aloe Butter activates skin using a precisely-engineered vitamin-revitalizing complex capable of treating dry skin. Apply on hands, arms, legs - anywhere your skin shows signs of aging.